Sometimes a Cooper can pass for A. Cooper. Also, by popular request, I'll be focusing on some non-MINI related topics for the next little bit... sorry SouthernJ. No Tailpipes On This One. This is happening… whether you like it or not. 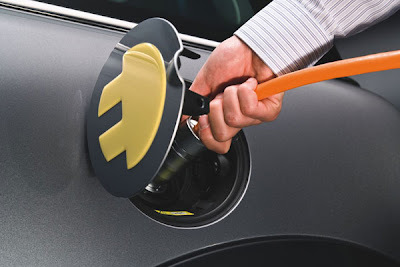 The first true electric vehicle to hit the roads for the masses (well sorta) is a MINI. Actually it’s the MINI E, not to be confused with WALL•E. The MINI E's electric drive train produces 220 Newton meters of torque and hits 6o mph in 8.4 seconds. Unfortunately, the top speed is electronically limited to 95 mph. 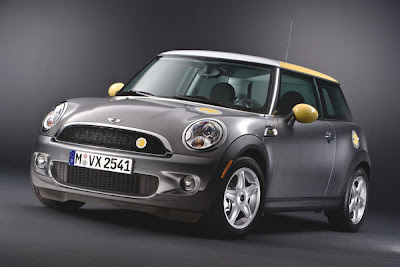 But the MINI E does feature a suspension system perfectly tuned to match its weight distribution and obviously sports the brand's hallmark agility and handling. 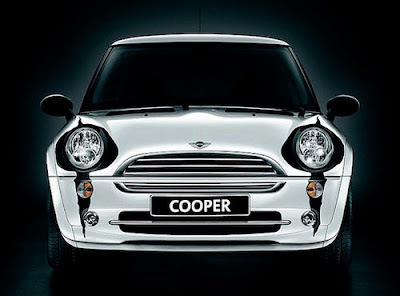 The plug-in electric Cooper only has room for two due to its massive lithium battery pack which sits where the Kyality Kids usually do. 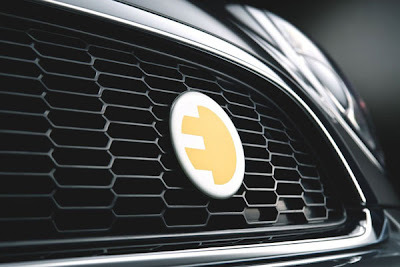 The new MINI E motif seems appropriate when positioned next to the current Carfun Footprint campaign that Struck recently completed with BSSP. There will be 500 of these dark silver and yellow Coops leased this upcoming year in California, New York and New Jersey. And the best part is this thing literally kicks out zero emissions. So rad. What’s next? Mr. Fusion? 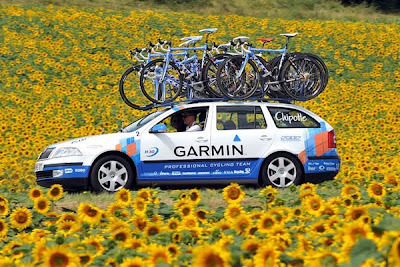 Lately, I’ve been way into cool pro cycling chase cars. Here are some of the sweetest ones I’ve found. 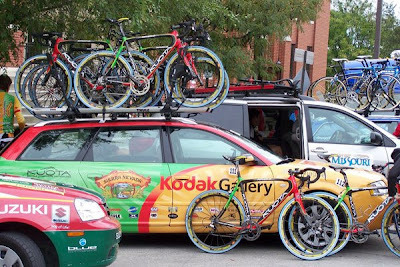 At work, I’ve been trying to put together a sponsorship for the best cycling team in the state, the Ski Utah Cycling team. We’ll most likely be designing their next round of jerseys. 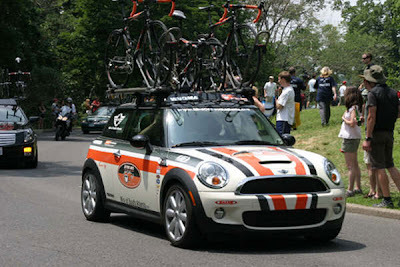 Who knows maybe they’ll need someone to drive a Clubman chase car one day! 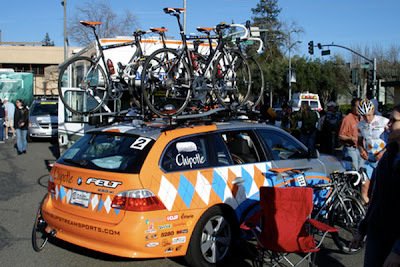 The Garmin/Chipotle team is by far the most stylish, gotta love the argyle motif. 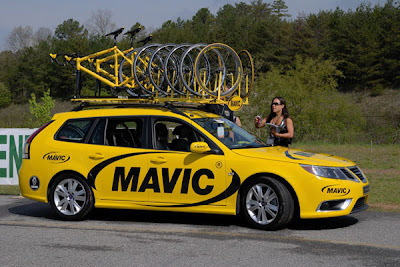 The Mavic team is pretty serious about this sport. 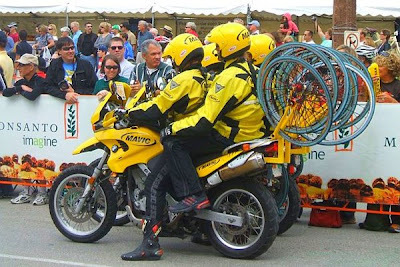 Check out the BMW chase bikes. Euro wagons are standard fare. 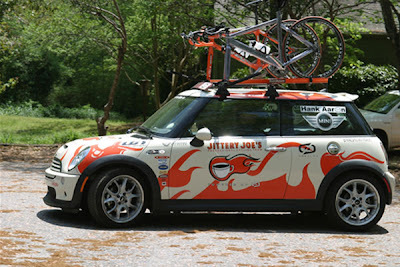 The Jittery Joe's team runs MINIs only. 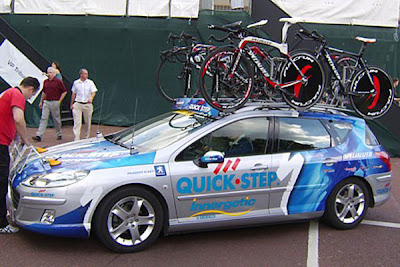 Here's one for a Specialized team. 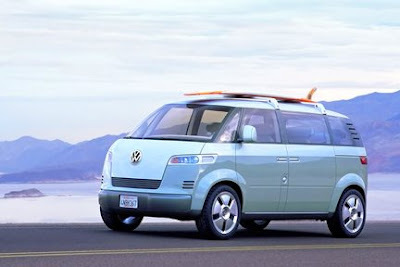 During the 2001 autoshow season, Volkswagen mesmerized crowds with their stunning Microbus Concept. It was a beautiful and progressive reinterpretation of their classic VW Bus based on the original Beetle chassis. Everyone with kids who laid eyes on that thing said to themselves: Yeah, I’d rock that! I’ve been waiting ever since then to write this, the review of the first VW minivan since the Eurovan. But alas, this is not even close to the review I was hoping to give. For the past couple of weeks VW has been advertising their new Routan; what’s being referred to their “German Engineered” minivan. Unfortunately, this couldn’t be further from the truth. Not only does this thing look like a Chrysler Town & Country, that’s precisely what it is. Yep, you heard me right. Apparently this “thing” is made in the exact same factory as the T&C. To be honest, referring to the Routan as a “thing” is giving it far too much credit—a Thing actually was a cool VW. 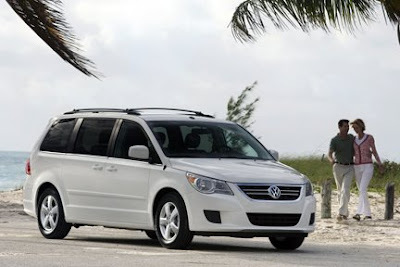 Rather than giving us the family vehicle we all lusted after, the boneheads at VW gave us a watered down Eurovan in the form of the crappy Dodge Caravan that I already have. Do they not get that they could have easily been the driving force behind bringing us the first genuinely cool family mover? In the words, well word, of the great Liz Lemon… blerg. 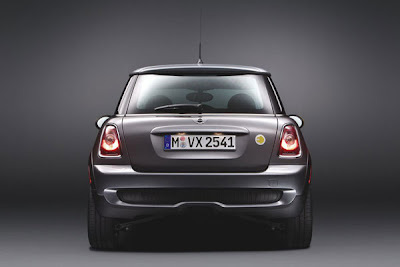 PS: Perhaps MINI will seize this wide-open window of opportunity. I could definitely go for a MINIvan. 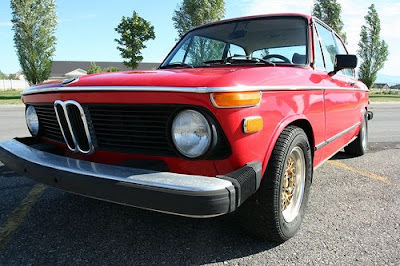 After 6 years of ownership, almost to the day, we sold our cherry red 1975 BMW 2002. It went to a cool, young couple who reminded us of ourselves (before we were outnumbered by our own spawn). He's a graphic designer and they already have a sweet old VW Beetle. It's sad to see the empty spot next to our garage, but I will be creating a little shrine in memoriam to our 2002. HabbenINK offered to retouch a photo of it—which will be matted and framed directly above a full color copy of the cashiers check for, you guessed it, $2,002.00 exactly.